I have been obsessed with alignment for the past few months. I never played Dungeons & Dragons growing up (in fact the first time I saw it played was in this season’s awesome Community episode), but the concept of alignment has fascinated me since I learned about it. Which characters personify each alignment? Where do I fall? Where do my friends fit in? I have a long commute so I have a ton of time to think :-). 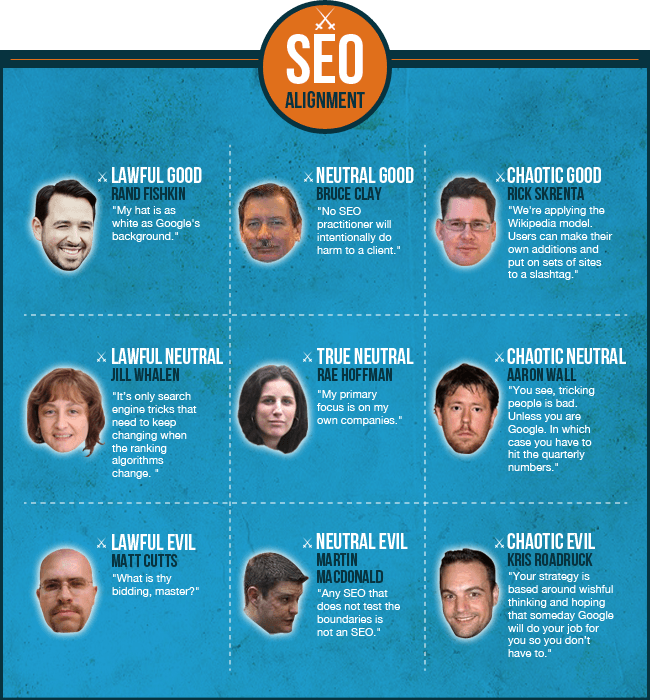 So in the spirit of obsession, here is my stab at an alignment chart for the SEO community. Notes, embed code, a detailed explanation of alignment, and references follow below. Lawful vs. Chaotic was determined by adherence to Google’s rules. There are really no public “evil” SEOs, so the non-Lawful Evils had to be blackhats. Sorry guys, you had to fit in somewhere. Matt, the similarities to Darth Vader were too strong to ignore. But I don’t really think you’re evil :-). There are two axes; Good and Evil, and Lawful and Chaotic. Each character’s motivations fall somewhere on both axes. Good is having good intentions towards others, evil is bad intentions. Lawful reflects respect for and adherence towards authority, chaotic means actively trying to overturn systems and authority. Neutral is outside of either motivation. So someone who has good intentions and follows the rules (Lawful Good) would be Superman. A good character who tries to upend the system (Chaotic Good) would be V from V for Vendetta. A character with bad intentions that seeks to overturn authority (Chaotic Evil) would be the Joker from the latest Batman films. And an evil character operating within the rules (Lawful Evil) is Darth Vader. True Neutral is self-interest as the primary motivation. House is a good example. The other Neutrals fall in between the other motivations. If you were wondering, I’m right between True and Chaotic Neutral :-).